You’ve had dentures for a while now, and although you’ve done your best to get adjusted to wearing them, there are still times when your artificial teeth wiggle while speaking and chewing can be difficult. You’re tired of missing out on your favorite foods and you hate to be embarrassed by your false teeth – kissing your sweetheart and putting your smile in a cup at night always make you feel self-conscious, no matter how many years you’ve dealt with missing teeth. But what if there were a way to upgrade your artificial teeth, improve your looks, and increase the density of your jawbone – all with one procedure? With implant-retained dentures from your trusted dentist in Indianapolis, you can combine the security of dental implants and the full arch of artificial teeth from dentures, to achieve results that are the best of both worlds. Learn more about this revolutionary option from the team at Indianapolis Family Dentistry. Titanium Implant Post – This is the secure foundation for your dentures. To start the process, you’ll have titanium implant posts placed in your jaw – these will fuse with the bone, making it stronger and becoming the strong base for your artificial teeth. 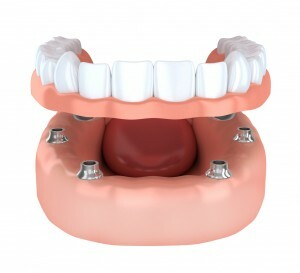 Abutments – For implant-retained dentures, we’ll place a number of posts in your jaw that will connect to your denture with pieces called abutments. These link the posts to your artificial teeth and are usually made of titanium, stainless steel, or zirconia. Dentures – We’ll use a slightly modified denture that can either be secured in place or that can snap in and out to act as the replacement teeth that are the final piece of your implant-retained dentures. Why Are Implant-Retained Dentures Superior To Regular Dentures? Comfort – Rather than dealing with discomfort, sores, or raw spots in your mouth from dentures, our implant options prevents these problems from occurring. Confidence – Since you’ll never have to worry about shifting denture when you speak, chew, or show a sign of affection to your special someone, you can remain confident that your artificial teeth will stay in place. Cost – Since dental implants and implant-retained dentures can last a lifetime with proper care, this solution will save you money in the long run. Jaw Strength – Because the process of osseointegration will make your jaw stronger, you can benefit from the increased density in your jawbone. Appearance – Implant-retained dentures look so life-like, the only person who’ll know you have artificial teeth is you. Now that you know what implant-retained dentures are and why they’re the better solution when compared to traditional false teeth, schedule your appointment with Indianapolis Family Dentistry to bring back your ideal smile!